Stakeholders - Zippy Technology Corp.
Zippy provides communication channels to our stakeholders for safeguarding their rights and interests, and designates a stockholders section on our website to update new issues of social responsibility periodically. It facilitates the transparency, instantaneity, completeness and interaction with stakeholders. Via the channels, we attain information from stakeholders and inspect the performance of the concerning issues and management policies to make further improvement. 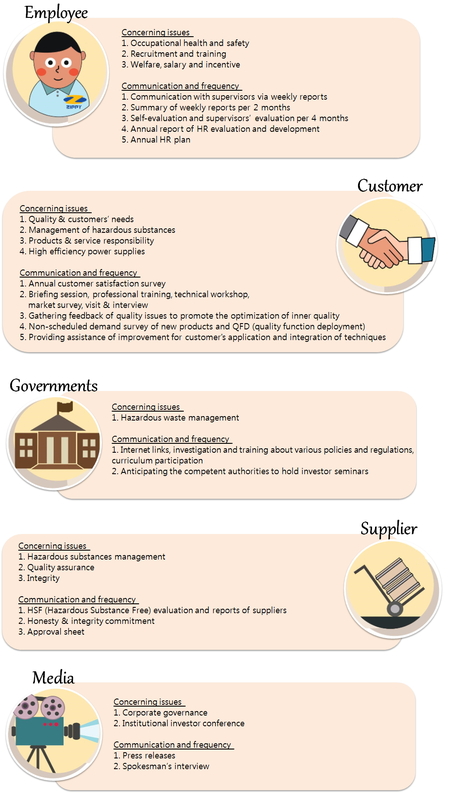 Zippy’s CSR team will consider the comprehensive aspects provided by respective departments and follow the GRI-G4 Guidelines and Implementation Manual. We analyze the stakeholder engagement and the influence of decision making, and evaluate the impact of economy, environment and society. Then we identify the significant aspects and define our stakeholders as employees, suppliers, customers, stockholders, government authorities, media and the third-party certification bodies, etc.